LED High bay light replacements for HID systems for customers seeking to save on maintenance and lower electric bills. They provide ideal light and coverage for manufacturing, warehouse, storage, retail, grocery, gyms, factory and other high ceiling applications. Yahua Lighting LED High Bays are dimmable and easy to install.ItemHigh bay lightBrandYahua lightingpower120watt-200wattLamp luminous efficiency110lm/wCRI(Ra≧)70IP65Input voltage(V)AC85-265VChipEpistar/BridgeluxLamp bodyAluminum alloyWorking temperature(℃)-40-60Working life time(hour)50000hourscertificationCE, ROHS, CCC, CQCWarranty3-5yearsApplicationWarehouse, supermarket,StadiumAdvantages:1. Led driver: Taiwan Meanwell led driver, most reliable and stable.2. Die-casting power supply box, best protect drive.3. Radiating: aluminum fins with holes structure, best heat dissipation, speed air flow, improve the heat dissipation performance.4. LED brand: Adopt Bridgelux and Cree leds, super bright leds, high lumen, longlife time.5. Environment-friendly, lead-free, no air pollution, no mercury.6. Unique surface treatment technology, well decorated, novel style, easy to install, lower maintenance cost and wide in application.About our high bay:Our LED high bay light are different from others mainly in power consumption and light distribution.Our LED high bay luminaire is an eco-friendly product because it does not contain lead, mercury or other harmful elements. On the other hands, its surface receives some special treatments to offer splendid decorative effects, and simple installation makes led high bay light suitable for a wide range of applications. Due to the high power LED light source, the luminous reaches up to as high as 110lm/w, and our high bay light saves 50% power when compared with conventional luminaire, the power factor is over 0.95, led high bay light is powered by 85-265V AC power supply, and this wide voltage range makes our led high bay applicable in any country around the world. 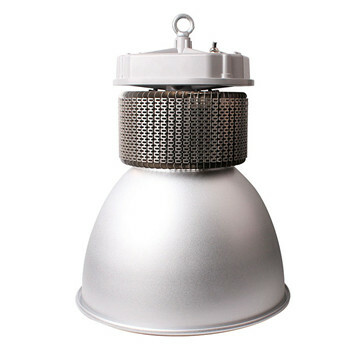 As a result of unique chip technology, led high bay light source is able to work quite a long time. Moreover, the lamp body and heat sink are integrated together to ensure high bay life is over 60,000 hours. For our led high bay light, its reflector is made from high-purity aluminum to realize wide beam angle and uniform luminance, while flickering and glaring problems are eliminated.